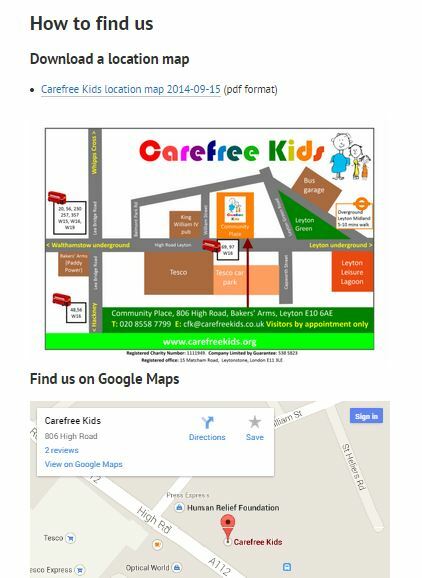 Carefree Kids is a small charity working in East London. I created a new website for them working on every stage from initial planning to implementation. The charity’s aims were to move the site from a Joomla! platform, which had been set up by an agency and which only one person knew how to update, to a self-hosted WordPress.org site so that more staff and volunteers could be trained to contribute to the site. By moving to WordPress and a new hosting service they were also able to reduce their monthly website costs to just the cost of the hosting (around £5 a month) and the cost of the domain name. Initial meetings were held in London, while I still lived there, however most of the work was carried out remotely after I moved to Ipswich. The site was delivered to schedule, just before the old hosting arrangement was due to expire and went live without any downtime. The graphic below was created on the original site using inline CSS code (the example here, however, is a screenshot saved as a graphic file). Inline CSS can only be used for basic text and colour graphics but has the advantage that the text can be read by screenreaders and Google Translate and so is more accessible. The charity is in an area of London where high number of community languages are spoken. Linking the site to Google Translate allows instantaneous and automatic translation in over 70 languages. Google Translate is far from perfect and can produce some howlers, but this goes a long way to including people who might otherwise be excluded — and this charity has never had and will never have the funds to undertake costly translation and interpreting. Using Google Translate is simply a process of linking the code on the site to Google Translate — it costs absolutely nothing. You can also see this in action on my site’s Translation page. The examples below show French and Gujurati. 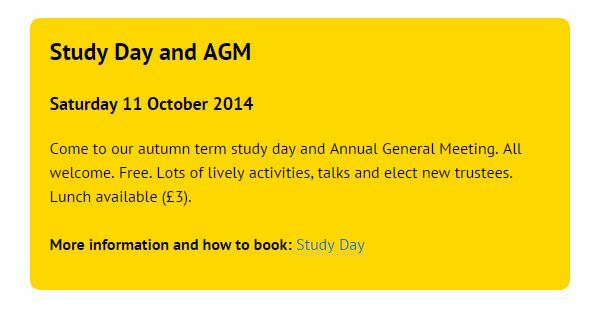 Note how the coloured buttons in the right sidebar, produced using inline CSS, have translated as well. 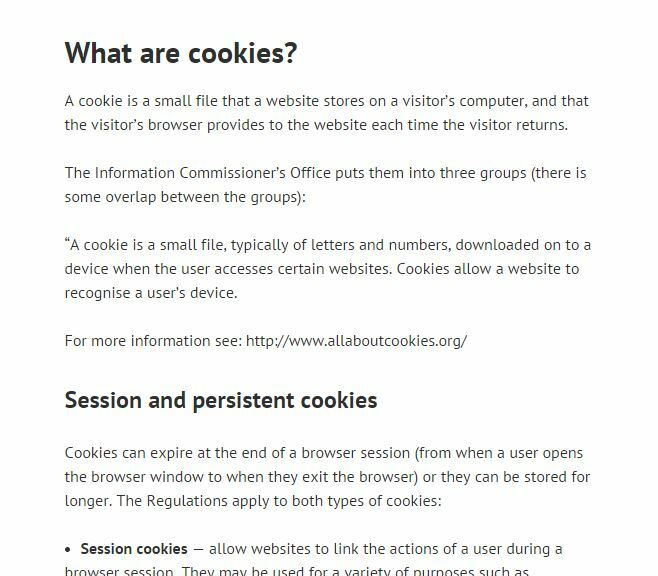 It’s been a legal requirement since 2012 to include a privacy and cookies policy on your website, but many sites still do not comply with the law. If you’re collecting personal data you should also have consent for that. Many sites do not comply. It’s easy and commonplace to embed a map from Google Maps into your website. Before you do, make sure though that you have submitted your details to Google Places through Google MyBusiness. Giving alternatives helps to increase the accessibility for everyone. I installed a testimonial plugin (it had to be a very basic one without complex settings) which I set up to work on both the sidebar and on selected pages. Unfortunately the plugin assumes you can add the photo of the person giving the testimonial — that isn’t feasible for this charity so I created a set of simple quotation graphics in different colours to replace the otherwise ugly hole left by the lack of a photo.